Photo by Monivette Cordeiro, Orlando Weekly. Nine months ago today an angry man walked into Pulse, a queer nightclub in Orlando, and murdered 49 people. According to the FBI and his own family, during the weeks and months leading up to the attack, he had become more noticeably outraged every time he saw gay men in public together. He plotted the crime carefully. He set up fake profiles on gay hook-up apps and used conversations there to find out which night clubs would have the biggest crowd. It was a carefully crafted anti-queer hate crime. A crime that is still being prosecuted: Orlando Nightclub Shooter’s Widow Is Denied Release On Bail. I’ve written before about why this particular crime hit so hard for queer people in general, and me in particular. I’ve also written about why it is unacceptable to argue there is nothing that we can do about this kind of crime: They used to insist that drunk driving couldn’t be reduced, either. I’ve also written about why we shouldn’t ignore the anti-LGBT hate crime aspect of this act of terror, and why the people who do so are perpetuating and enabling the hate that caused it. And I’m not the only one: Call the Orlando shooting what it was: a homophobic hate crime, not ‘an attack on us all’. I didn’t let myself write about the shooting on the 7th- or 8th-month’s mind1 date of the shooting because the lingering depression from election night made it too easy for me to leap into slathering rages over things. I had a very difficult time writing a post at the 6-month mark because of it. But there are reasons we shouldn’t forget: Gov. Rick Scott Honored Pulse But Never Mentioned LGBT People – Florida’s governor described the shooting as terrorism and never noted it targeted queer people. I’ve gotten into the spiral of argument with some people that all hate crimes are crimes intended to cause terror, so it is technically correct to call it a terrorist act. And while that is true, it sidesteps the issue of just who was the crime intended to terrorize? We know that the gunman was targeting queer men. We know that because of all the angry outraged rants his family and colleagues have revealed during questioning. We know because he told his wife that he wanted to kill fags (she knew what he was planning, which is why she’s under arrest). We know because of the conversations he had on hookup apps where he would engage in conversation with gay men and ask which clubs were the hottest—where can he go to find the biggest crowds, the most popular places for gay men to have a good time? He did not commit this crime to terrorize straight Americans. He was out to kill as many queer men as he could, and to put the fear of death into all queer people not to be out. That’s the point of this crime: to make queer people hide, go back into the closet, stop being out and open and unashamed of who we love. And if you don’t refer to this crime as an anti-queer or anti-gay or anti-LGBT crime, then you are doing exactly what the gunman wanted: you are erasing us from public life and discourse. And if you get insistent and defensive about failing to mention that it was a anti-queer crime? That tells us, beyond any shadow of a doubt, that on some level, you agree with the gunman. That’s not me calling you a bigot. That’s you being a bigot. If you don’t like to think of yourself as a bigot, then you need to do something about that. A really good first step is to admit that being uncomfortable denouncing a crime as an anti-queer/anti-gay/anti-lesbian/anti-LGBT/anti-trans crime is a symptom of some level of prejudice. Which you need to let go of. Start calling this shooting what it was: a hate crime aimed at the LGBT community. Yes, 49 people were killed in Orlando that night. 49 queer Americans were gunned down. 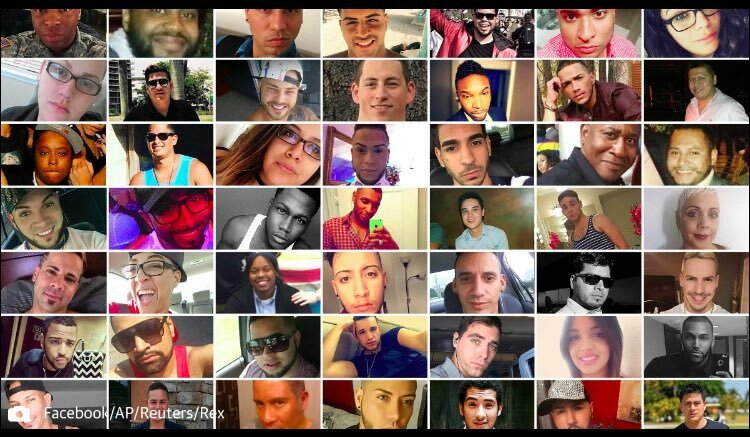 49 queer people who just wanted to be out and happy and not have to hide who they were instead were murdered. 49 queer people were murdered by a man who was outraged at the idea of two men kissing in public. Remember them. Don’t erase their identities. Don’t erase their killer’s anti-gay hatred. 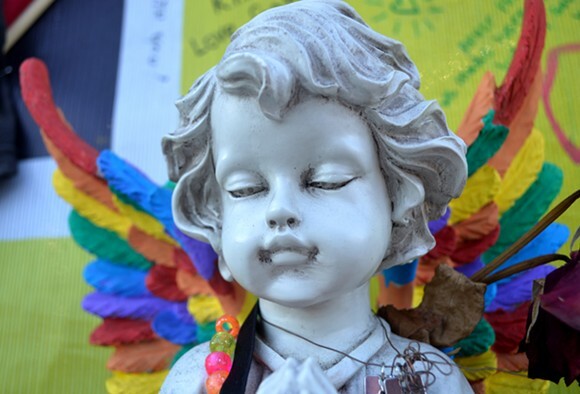 Don’t ignore the toxic homophobia the pervades American society and fed the gunman’s hatred. Don’t help the killer erase us. Don’t. 1. “Month’s mind” a practice in some traditions where family and friends gather about a month after someone’s death to celebrate that person’s life2. 2. Yes, I’m pedantic enough that I don’t like using the word “anniversary” to refer to periods of time of less than a year. I know people have been doing it verbally since at least the 1960s, and in writing since the 1980s, and I’m not normally a staunch prescriptionist regarding dictionary definitions, but this one still bugs me a little. Most of the terms that have been proposed to substitute (mensiversary, lunaversay, and uncianniversary) for this monthly commemorations strike me as silly. But knowing that there is an older, if obscure liturgical term, that I can pronounce it easily, I’m going to give it a try.